From The New Criterion. January 31, 2015. Stop me if you’ve heard this one before. I have told the story elsewhere of my moment of epiphany in understanding the British national character and, in particular, its relationship to irony. My son was being inducted into the Boy Scouts and, as part of the ceremony that parents were invited to attend, the boys played a game. They all stood in a circle around the scoutmaster, who threw a soccer ball in the direction of a boy chosen at random. As he did so, he called out either "head" or "catch." If he said "head" the boy was supposed to catch it, and if he said "catch," the boy was supposed to head it. If the boy caught it in response to "catch" or headed it in response to "head," he was out, and the game continued until only one boy, the winner, was left. It was great training in the uses of irony, or the principle that meaning depends on context, and perhaps helps to explain why Britons seem to understand this principle instinctively when so many Americans struggle with it. Everyone in Britain, for instance, instantly understood the meaning of the tweet posted on the day in November of an important by-election in the constituency of Rochester and Strood by Emily Thornberry, a Labour Member of Parliament and shadow attorney general until she was fired for it by "Ed" Miliband, the Labour leader. 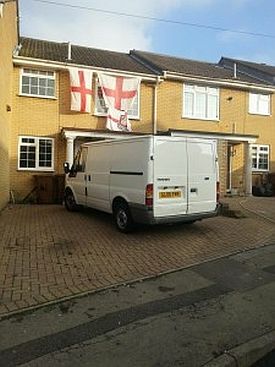 The tweet consisted of a photograph of what Americans call a row house with a bricked-in forecourt, on which was parked a white van, and three red-cross flags of St George (the patron saint of England) — one of them adapted as the emblem of the West Ham football (i.e. soccer) club — draped over the façade. Accompanying the photo were the words: "image from #Rochester." The Guardian helpfully provided a guide to the perplexed foreigner, who might wonder why, in the words of the headline, "a British politician lost her job over a tweet." But all you really needed to know about was the storied existence in the UK of something called "White Van Man," a kind of lower-middle-class striver, presumably a self-employed builder or handyman, who excites the contempt of a certain kind of upper middle class and usually left wing snob. There was no reason to suppose that Ms Thornberry was that kind of snob — apart from the fact that she is, by most people’s standards, rich, and that she belongs, with a lot of other rich people, to a party founded to represent what in Britain they still call, with as little irony as possible, "the working classes." In that context, all she had to do was notice the existence of a presumptive White Van Man — especially if he was also vulgar enough to have mock Doric columns on his pretentious hovel and to display a naive English (and therefore probably racist) patriotism — to demonstrate that contempt. The by-election was occasioned by the resignation of the sitting Conservative MP, the nominatively determined Mark Reckless, who had resigned the party whip and run for his old seat as a member of the United Kingdom Independence Party, or UKIP. He won. Labour, which had held the seat (or that of its predecessor contituency, Medway) from 1997 to 2010, finished a poor third. It was doubtless in anticipation of some such result that Ms Thornberry — who could but does not style herself Lady Nugee, since she is the wife of a knight — issued her tweet and Mr Miliband sacked her. Local UKIP voters were presumed by many to have been recruited largely from among former Labour supporters whom the party must win back if it is to be successful in next year’s general election. Accordingly, when asked what he felt about people who hang the flag of St. George from their windows, Mr Miliband replied: "Respect." It is no exaggeration to say that nobody from among the British political élites believed this — probably not even Mr Miliband himself, who seems in any case to have been reading from a script prepared by someone else. It was just because everyone knew respect was precisely what he and his fellow bien-pensant socialists do not feel for the likes of White Van Man that Ms Thornberry’s tweet had gained national attention in the first place. In other words, it was at least as well understood that "respect" meant "disrespect" as it was that "catch" meant "head." The political culture in Britain is full of such ironies — which is to say words, phrases or slogans that are understood in different ways by different audiences but rarely mean what someone without a highly developed sense of irony would suppose they mean. If you were one of the literal-minded who believed Mr Miliband’s profession of respect, for instance, you were by the magic of irony precisely the person (or at least one of the persons) that he was telling others he didn’t respect. In America at about the same time, a similar situation arose when an economist named Jonathan Gruber who had helped to design the provisions of the Patient Protection and Affordable Care Act, better known as Obamacare, confided to an academic conference that, in drafting the bill, he and others had made it deliberately obscure, not to say unintelligible. "Lack of transparency is a huge political advantage," he said. "And basically, call it the stupidity of the American voter or whatever, but basically that was really, really critical in getting the thing to pass . . . So there are things I’d wish I could change, but I’d rather have this law than not." He later apologized, saying he had misspoken. But he had said similar things on more than one occasion which had unaccountably not got into the media — that’s a little irony for you there, reader — and in any case was no more believed than Ed Miliband when he said he felt respect for White Van Man. In the context, we could have guessed what Jonathan Gruber, and his political masters, thought of "the American voter" without his telling us. Czeslaw Milosz said that irony is "the glory of slaves," but it can also be a tool of the powerful, or seekers after power, to proclaim a sympathy they do not feel with those they wish to exploit and at the same time to affirm a solidarity with the cognoscenti who know what their words really mean. Typically, irony involves a tension between content (or the literal sense of something) and context, but, as these examples suggest, in a corrupt rhetorical culture like ours context always trumps content and very often renders it negligible. As readers of The New Criterion will know, the art world led the way in growing to be largely contextual in this sense, and art itself can now only be defined as that which appears in museums or galleries — the most basic artistic context. Its content may be and often is merely offensive, or else silly, trivial, absurd or otherwise insignificant, but in the proper artistic context it may claim the prestige and therefore the meaning of "art." We are all now living in the world of Susan Sontag’s camp, which "sees everything in quotation marks." It is not remarked upon often enough that the same is increasingly true of our political life. The ironic or camp politics of the "war on women" or "do nothing", "trickle-down" Republicans who want you to die rather than having health care necessarily betokens a gap between the government, including the unofficial government of the media, and the governed. And — as both White Van Man and his more organized American counterparts in the Tea Party have sensed — that gap in turn betokens the contempt of the former for the latter. I think you could even say that a similar sense of alienation from authority and resentment at being treated with disrespect by those in power lay behind the riots in Ferguson, Missouri, and elsewhere over the death of the black teenager, Michael Brown, shot by a policeman there last summer. But the language of politics in America has grown so impoverished, so utterly dominated by context over content, that the resentment of the protestors had no words with which to express itself except the plainly inadequate one of "racism." There was no evidence whatever that Officer Wilson, who shot Michael Brown, acted out of racial animus. No more did Officer Pantaleo of the NYPD whose chokehold on Eric Garner resulted in his death on Staten Island later in the year. But because grand juries refused to indict the officers in both cases, the historical and now political context of a general indifference or even hostility on the part of authority towards black lives blew away any consideration of the details of the two cases. It was enough that the victims were black and the policemen white for the whole matter to default to the classic paradigm, on which the racial grievance industry has thrived for years, of white authority figures brutally exercising an illegitimate power over oppressed blacks. Michael Brown himself cannot but have been encouraged all of his short life to take this view of his relationship to authority, which must be why he acted in defiance of authority on the day he was killed. As someone calling herself educationrealist put it "One could say that Michael Brown is dead because he was foolish enough to treat a cop like a teacher." Needless to say, no one in big media was prepared to look that deeply into things. To them, as they wheeled their cameras into place so as not to miss a single moment of the rioting in Ferguson they were confident would result from the grand jury decision, the facts of the case mattered no more than they did to the rioters who came out in response to perform for the cameras. Both were happy to play out their roles in the familiar media "narrative" of murdered innocence. This was not necessarily Michael Brown’s narrative, or even Eric Garner’s when the riots spread to New York on the basis of that grand jury decision, but that of all those who felt themselves excluded and marginalized in the world of those who exercise power over them. Even if, at street level, that context didn’t seem to matter to the participants, living and dead, in the rhetorical world of the media it was all that mattered or could be allowed to matter. Everything else, therefore, became a "lie." That was the word applied by Jonathan Jones of The Guardian to the widely circulated photo of a young black boy in tears hugging an apparently sympathetic cop in the middle of a Ferguson protest. Mr Jones didn’t mean that the photograph was faked. No, he concedes, it was genuine enough, but "in the context" (my emphasis) "of the completely unresolved and immensely troubling situation, not just in Ferguson but across the United States, where Ferguson has opened wounds that go back centuries, this picture is a blatant lie." What he means is that it is at odds with the supposed contextual truth that matters to politically motivated left-wingers like Mr Jones and his fellow Guardian radicals. Similarly, Charles M. Blow of The New York Times argued that the mere facts of the two cases in Ferguson and Staten Island constituted a "counter-narrative" to the contextual one which, in his view, had to prevail. Any attempt to apportion even a share of blame to the dead victims themselves, he says, is in fact an argument from "black dysfunction" or "black pathology" and therefore "racist at its core because it rests too heavily on choice and too lightly on context." In the same way, the protest mantra of "Hands up, don’t shoot" continued to be regarded as expressive of a larger, a contextual truth, even though the grand jury didn’t believe that Michael Brown had ever raised his hands in a gesture of submission, any more than that was he shot in the back as the earliest witnesses claimed. But we must all now be regarded as the prisoners of our contexts, good or bad, which means that there can be nothing to be said for the Emily Thornberrys or the Darren Wilsons of the world who act imprudently or overhastily in a context that gives their actions a meaning they may never have intended, but that serves someone else’s political ends. There could be said to be a further similarity between those two cases in that both appeared to have resulted however unfairly, from a Jonathan Gruber-like lack of respect on the part of authority for those over whom it was exercised. Rudy Giuliani got in trouble for asking why everyone was focusing on Ferguson when far more young black men are killed by other blacks than by policemen. It was a good question, but he should also have made the point that, for black people, the two problems are inter-related. The legend of an indifferent police force’s regarding black-on-black crime as a "self-cleaning oven" is part and parcel of the perceived lack of respect for or value placed on black life by those in power, who have proportionally lost authority or respect for themselves. I wonder how far the triumph of context over content in our rhetorical life is itself responsible for the stubborn ineradicability of these problems. Contextualism in politics, as in art, is a form of intellectual rent-seeking, a claim to authority based on nothing but generally recognized claims to ownership of the most desirable political or artistic clichés. Nobody can be allowed to doubt, for instance, that the cliché of black oppression by white authority is the exclusive property of Democrats, even when Democrats are themselves the ones in authority. No more can anyone doubt that the cliché of "law and order" belongs to Republicans, even if they may not want to claim Officers Wilson and Pantaleo as their own. But people are likely to see such authority as by definition corrupt, and the farthest thing imaginable from government by the consent of the governed, who are instead sectioned off into tribes owing allegiance only to one set of clichés or the other. The factitious conflicts that result are of course meat and drink to the media, who therefore, in their turn, have a powerful but corrupt interest in encouraging them and keeping them going. The contempt of each side for the other therefore tends to result in contemptible behavior by both sides and the very hatreds and disdain that were said to have produced them in the first place. But my own confining context in these agreeable pages will doubtless guarantee that I will not be listened to if I urge others not to be confined by theirs. And so the world goes on, ironically enough.